Chia seeds are the highest combined plant source of omega 3, fibre and protein, and are high in vitamins, minerals and antioxidants. Chia offers essential nutrition often missing in modern diets. Adding a tablespoon (15g) of chia to your diet each day provides 3g of omega 3, 6g of dietary fibre and 3g of complete protein. Chia is rich in omega 3, an essential fatty acid derived from plant sources. Heart Foundations around the world recommend an intake of at least 2g of omega 3 every day. Chia contains the perfect ratio of both soluble and insoluble fibre. Soluble fibre forms a gel in water, while insoluble fibre remains close to its original form throughout the digestive path. Both types of fibre are vital for healthy digestion. Chia contains eight essential amino acids, making it a complete protein. Complete proteins from plant sources are very rare, making chia a fantastic source of nutrition for vegan and vegetarian diets. Chia is one of the highest known sources of antioxidants, which are vital in the maintenance of healthy cells. Antioxidants combat the oxidation process caused by sun exposure or pollution, carrying free radicals out of the body. The nutrients in chia can help to sustain energy, improve digestive and heart health, and encourage healthy skin, hair and nails. Chia is also fantastic exercise fuel, helping you stay hydrated, increasing stamina and aiding in muscle repair. Chia’s high levels of fibre aids digestion. 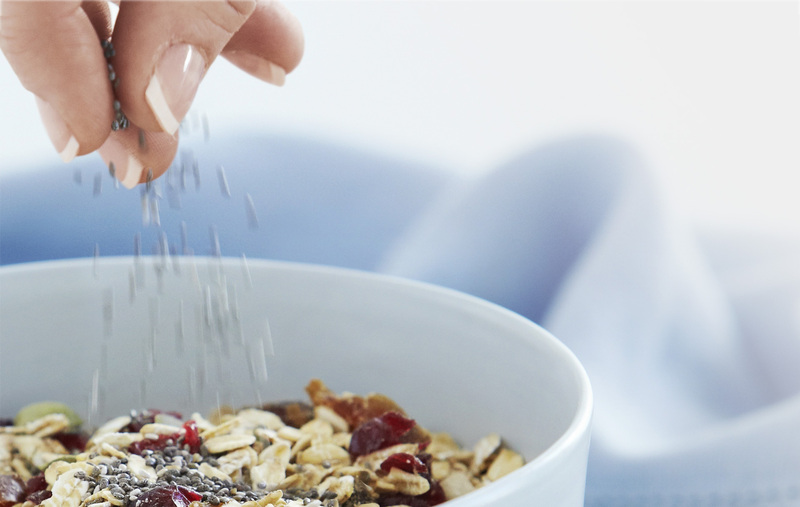 Soluble fibre can help to moderate blood glucose levels and lower cholesterol. Insoluble fibre provides roughage, clearing out toxins as it passes through your digestive tract and lowering the risk of colon cancer. Omega 3 is essential for heart health, working to lower cholesterol while maintaining proper artery function. Omega 3 can reduce the risk of heart disease by helping to maintain a normal heart rhythm, and can improve circulation. The complete protein in chia is essential for a healthy body. Our bodies use protein to build and repair tissues, to make enzymes, hormones and other body chemicals. Protein is also integral to the structure of our bones, muscles, cartilage, skin and blood. Chia’s rich balance of nutrients – fibre, protein, omega 3, antioxidants, vitamin B, copper, iron, calcium and magnesium – can contribute to slowing the aging process, boosting skin hydration, encouraging healthy hair and nail growth, and increasing cell regeneration. 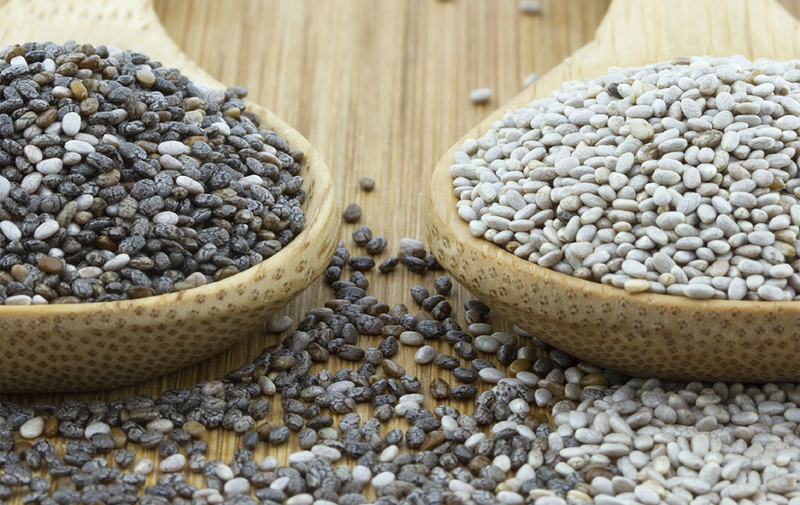 Chia seeds can be either black or white, but should never be brown. There is no nutritional difference between black and white chia, however brown chia is unripe and will not contain full nutrition. Chia is a great source of nutrition for vegan, gluten-free and raw diets. Chia is naturally gluten-free, can be eaten raw, and can even be used as an egg replacement in vegan baking. Unlike other seeds, chia has a soft outer shell and does not need to be ground. Chia seeds have a neutral taste which means you can easily include them in any meal – simply add a tablespoon of chia to muesli or cereals, into your salads or smoothies, or use in your baking. Our chia is sustainably grown. We provide chia in a range of products – black and white Chia Seed, Ground Chia, Oats+Chia, Chia Pods, Chia Boosters and Chia Oil.